Not 1000 years but almost. Precisely, 919. Yes, because the Explosion of the Cart, the folk tradition of Florence when on Easter Sunday a cart packed full of fireworks is lit providing a 20-minute pyrotechnical spectacle that symbolizes the distribution to the whole city of the benedict fire, has its origins in the First Crusade, when Europeans laid siege to the city of Jerusalem in a conflict to claim Palestine for Christianity. Let’s try to understand better this local tradition and the historic meaning behind it. It was exactly in 1097 that Pazzino de’ Pazzi returned from the crusades in Jerusalem and presented his city with three flint stones from the Holy Sepulchre and told the people of Florence to use these stones to light a ‘holy fire’ on a cart, or as it is often nicknamed, ‘Brindellone,’ (tall and wobbly), to celebrate Christianity at Easter time. 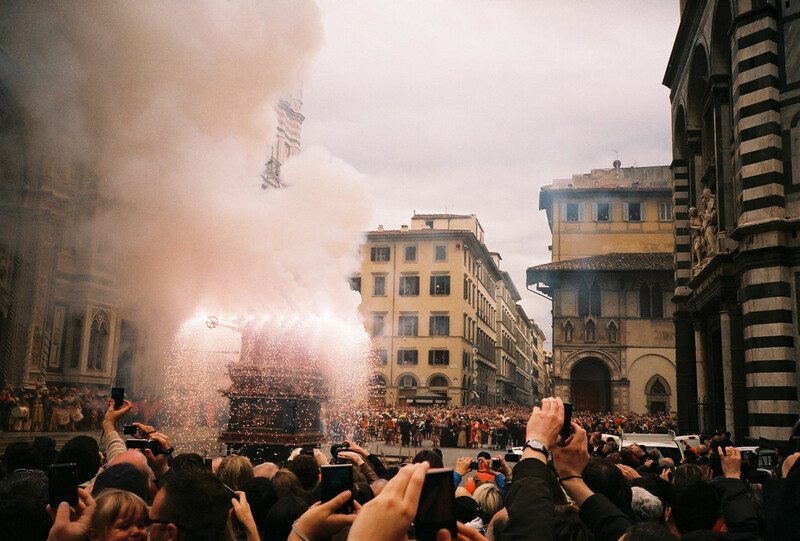 This ritual has continued ever since, but has naturally developed over the years, and now is one of the most exciting and impressive spectacles in Florence. Pazzino’s original flint stones are rubbed together and used to light the Easter candle; the candle is then used to light the cart itself. The cart embarks on a procession through the streets pulled by big white oxen, accompanied by hoards of crowds dressed in 15th century attire, musicians and flag throwers. Thanks to modern technology, the simple cart fire has now been enhanced by an elaborate firework display that the Archbishop of Florence ignites directly from the nave of the Duomo, where the cart ends its journey through the city. A dove shaped rocket is lit by the Archbishop which darts along a steel wire from the high altar to the cart outside, setting off the awaiting celebratory fireworks between the main door of the Duomo and the Baptistery. This jubilant explosion ends the solemn tone of the cart’s Easter morning procession through Florence. Symbolically the mod- ern fireworks that can be seen throughout the whole city spread the ‘holy fire’ to all, wishing everyone who can see them a Happy Easter. It is said that if the fireworks are enjoyed without any glitches, the city and its people can expect a good harvest for the year. Hence, it is an extremely popular event. In order to secure a good position amongst the thronging crowds that can reach up to 10,000, it is vital to get there early in the day. This year Easter Sunday falls on March 31, and the fireworks will begin at 11 a.m, accompanied by a beautiful rendition of ‘Gloria in Excelsis Deo’ from the Duomo; however, the atmosphere surrounding such a long standing tradition will surely be worth soaking up even before the fireworks begin. While the day reminds Florentines of their country’s profound Catholic roots, it also celebrates its past military success in the first crusade to the holy land, making the ‘Explosion of the Cart’ an especially festive and celebratory occasion, completely unique to Florence.